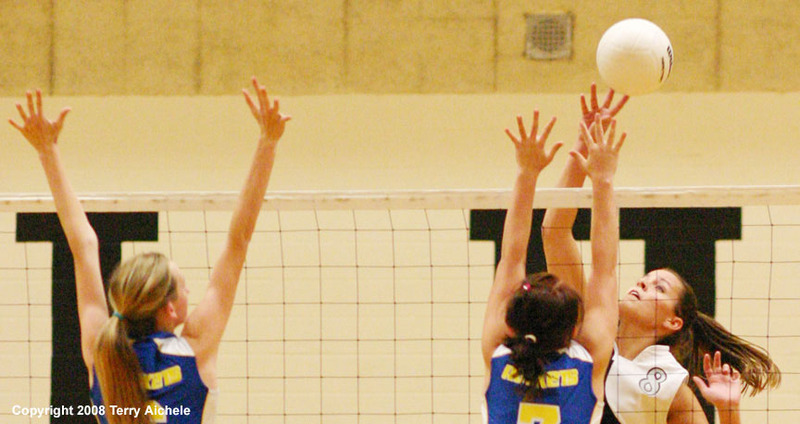 Leslie Coffman of Irrigon spikes the ball against two Pilot Rock defenders during the match on Thursday. IRRIGON - The Irrigon Knights lost to Pilot Rock on Thursday. The lady Knights fought hard but came up short in the three game sweep. Irrigon came out strong in the first set taking a 7-3 lead. Pilot Rock came back to tie it at 7-7 and take a 9-8 lead. With Beth Reeves serving Irrigon battled back to take a 14-13 lead. Pilot Rock using strong front line work and some strong serves by Renee Mulcare and MacKenzie Graham to take a 23-19 lead which Irrigon couldn't overcome before the Rockets won 25-21. The second game was controlled early by the Rockets during the service run of Mulcare which included an ace to take the 10-4 lead. Even with kills by Leslie Coffman and Cheyenne McKenney the Knights couldn't turn the game around. The Knights did show a lot of heart when they battled back from being down 20-11 to close to a final score of 25-19. The third game had Irrigon showing they still had the fight in them that showed in the second game. The Knights started off leading 4-1 in the opening moments of the third game. The teams tied it up at 7-7 and from that point on the Rockets consistancy of play at the net allowed them to pull away from the Knights. While there some long volleys the scoreing swung in the Rockets favor with Mulcare serving out for Pilot Rock from 19 points on out to the win at 25-14. LEFT - Irrigon Knights Samantha Egge, left, and Leslie Coffman leap at the net to attempt a defensive block against a Pilot Rock spike. 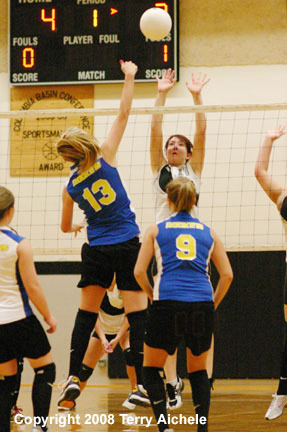 RIGHT - Beth Reeves, left and Samantha Egge of Irrigon block a shot by the Rockets. LEFT - Leslie Coffman goes low to bump a serve. Backing her up is the Irrigon libero Staci Stanger. 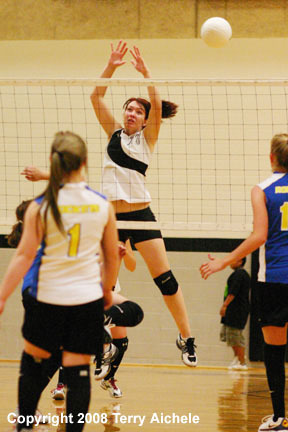 RIGHT - Irrigon's libero, Staci Stanger bumps a serve. 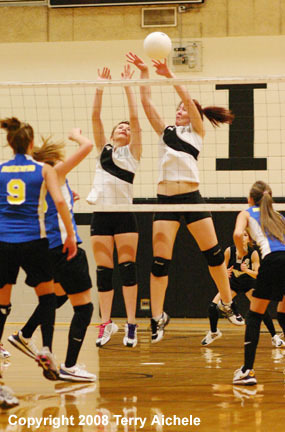 LEFT - Samantha Egge at the net attempts to block a spike by Brittney Doherty of Pilot Rock. 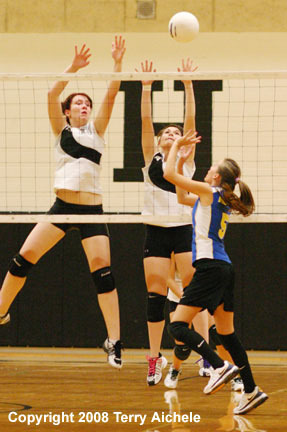 RIGHT - Jessica Henrichs of Irrigon battles Brittney Doherty at the net. 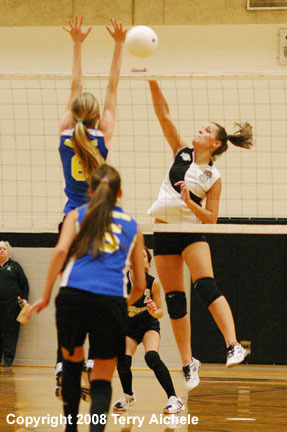 LEFT - Samantha Egge blocks a spike by a Rocket. 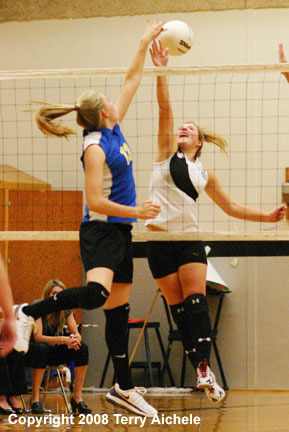 RIGHT - Leslie Coffman of Irrigon spikes the ball during the match on Thursday.